I must be a sick person, but sometimes I enjoy watching my friends squirm and turn bright red while experiencing authentically spicy food. This wasn’t the first time this week that I had nearly brought a buddy to tears of spicy pain. 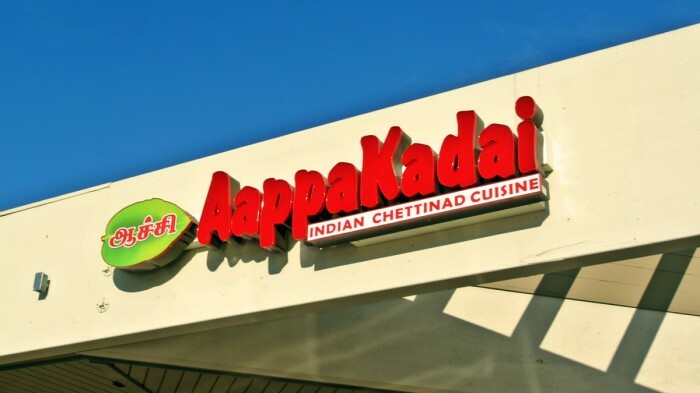 On this evening, four of us headed to a restaurant called Aachi Aappa Kadai in a very Indian-heavy area of Sunnyvale, CA to sample food from the Chettinad region. With a name like that with so many A’s at the start, I’ve got to wonder if they did it to get their name at the beginning of the Yellow Pages (when they were still relevant). If I had to guess based on the reaction of the staff and regular dining guests, they don’t see many white people at this restaurant, maybe they never have at all. Everyone in the restaurant was Indian, like very Indian. Nobody was speaking English, except when speaking to my table to take our orders. I was definitely getting looks from the staff and regulars just being in there. The restaurant was enormous, though for some strange reason also practically empty during the prime dinner time-slot when we had arrived. The decor was distinctly Indian with regards to the paint color and imagery on display and sitar-tinged Bollywood music blasted over the main sounds system while equally as loud music cacophonously competed in the open kitchen. I’m not sure why they would set up the music up like that. It was actually pretty annoying, to be honest. But whatever, I was there to eat. I decided to begin my meal with a soup. The waiter looked right at me and said, this is really spicy. I told him that ‘yeah, spicy is good’ and to bring it on. I guess I felt like I needed to prove myself to show him that I wasn’t his average white-guy diner. Yeah, I can take it, spicy is fine, let’s do this. But, he was totally right to warn me. This brothy bowl of soup was pure hellfire. Every spoonful compounded onto the previous, ultimately leaving my entire mouth and lips completely numb and tingly. It was very flavorful and delicious, yes. But it also walked the precarious line between pleasure and torture. Next, I impulsively ordered a dish called Chicken Lollypops. I don’t know exactly what drew me to it, I just had a good feeling about it and went with it. Out came plump drumsticks with the unnecessary, thin, meatless, middle-part trimmed away. What remained was thick knobs of bone-on chicken meat, glowing red on the outside and tinged yellow all the way through. This was certainly some of the juiciest, meatiest, most flavorful chicken I’ve ever had. 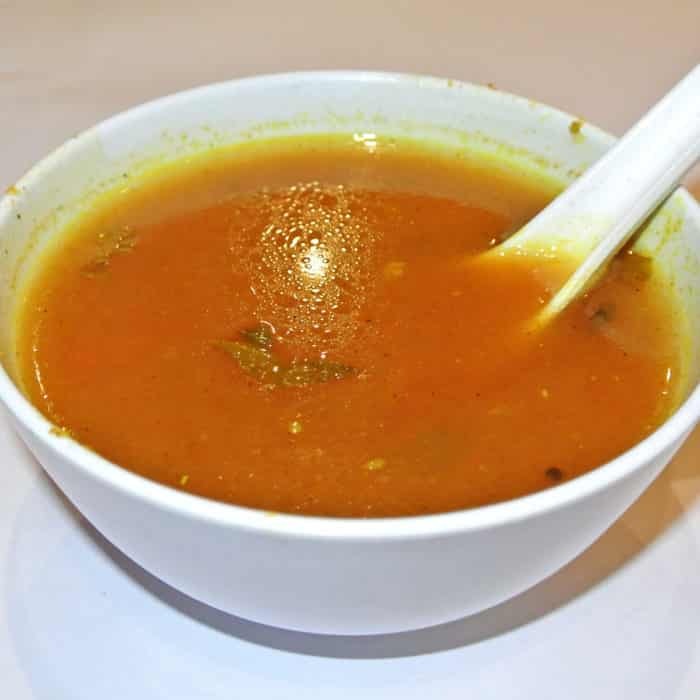 And I think it was spicy too, though I really couldn’t tell because that infernal soup blew out my sense of spice. One of my friends decided to order a dish called Kal Dosa as a starter, thinking it would be a small, bready side dish to pair well with the curry he had also ordered. 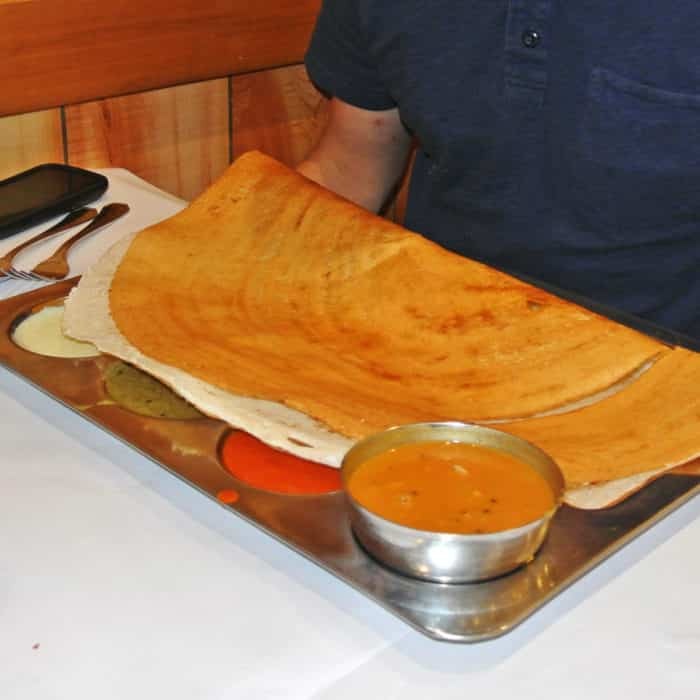 As it turned out, the dosa was ridiculously enormous. Even folded over, this massive, savory Indian flat-pancake extended past the oversized silver platter it was served on. It came stuffed with spiced mashed potatoes, a dal curry, and a couple chutneys all which were very tasty when eaten with the paper thin dosa. For my bread choice, I selected Buttered Naan. This butter-smothered, fluffy, pita-like bread came out piping hot and paired really well with the rich, creamy, spicy, meaty, curries I had also ordered. Naan is not really meant to be judged on its own, but when loaded up with spoonfuls of curry it served its purpose very well. And speaking of curry, let dive right in. The first selection was called Aachi Fish Kolumbu. I read a positive tip about this dish on Foursquare so I figured I should give it a shot. Unlike other fish curries I’ve eaten elsewhere previously, the fish here was not breaded or deep fried and was cut crosswise like a steak with the skin still intact. They didn’t do a very good job removing fish bones either, so eating this curry was pretty challenging. Also, the curry tasted rather fishy which I didn’t find particularly pleasant so I didn’t have more than a few bites of this one. 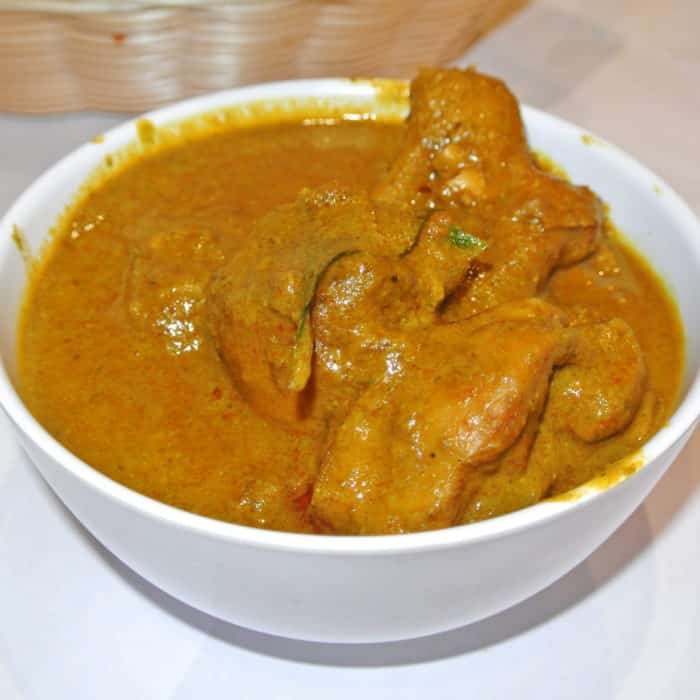 Next up was the Chef’s Special Chicken Curry. Once again we found ourselves caught off guard by the inclusion of bones. We struggled to remove the meat from the broken bones, but it was far too easy for little bits of bone-shards to hide within the curry camouflage. The curry itself was actually really flavorful and excellent, especially when spooned onto the buttered naan, but it was just too difficult to eat around the bones to recommend. Next time I would specify the boneless chicken version of the dish. Lastly, we had the Mutton Roast Curry. 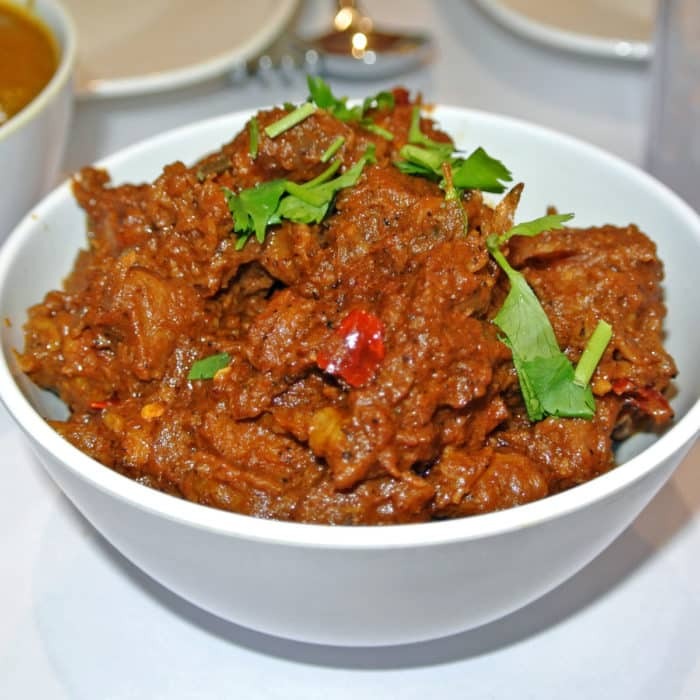 This goat curry was thankfully served boneless and really packed a punch. Hidden within the complex, flavorful, brown curry were vivid, red, chile peppers ready to inflict their gastronomic damage. I did my best to avoid consuming those little demons to minimize the impending gastrointestinal wrath of Vishnu, but I still found this dance with the devil totally worthwhile. 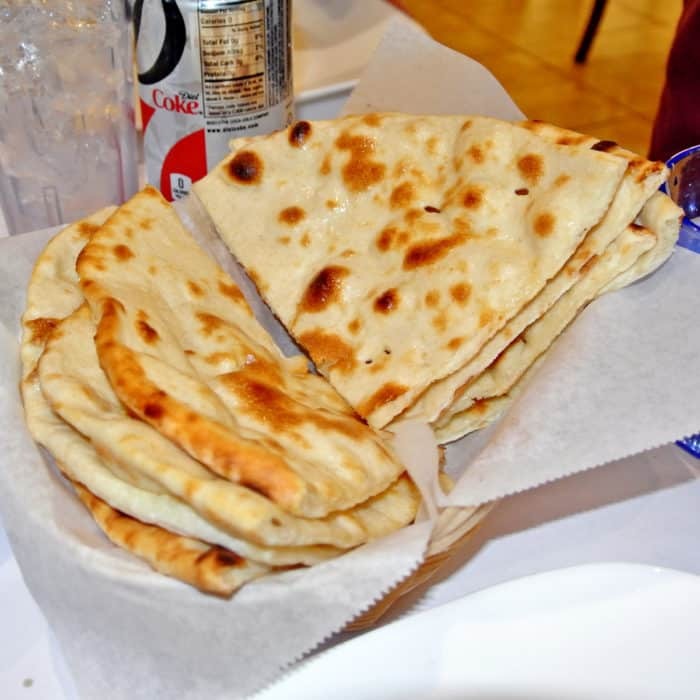 The meat was incredibly tender and spread easily onto pieces of buttered naan. Every bite bursted with hearty, complex, meaty, gamey curry flavor. This was one of the best goat dishes I’ve ever eaten. Although we had a few missteps along the way, especially with regards to eating around bones in the curries, the food at Aachi Aappa Kadai was legit. Everything came authentically spicy, so much so that it nearly brought one of my friends to tears. But, everything still had interesting and complex flavors, it wasn’t just spice for the sake of spice. 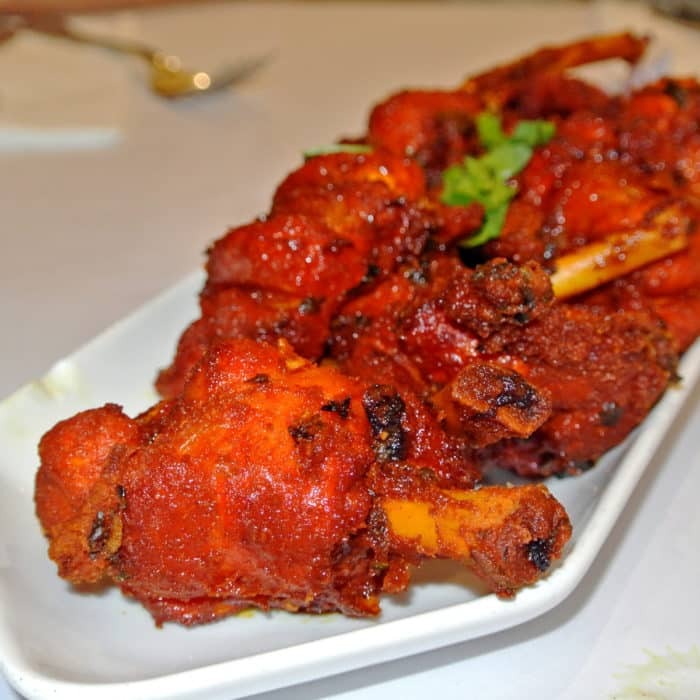 Whatever you do though, if your come to this restaurant, make sure you don’t miss out on the Chicken Lollypops or Mutton Roast curry. 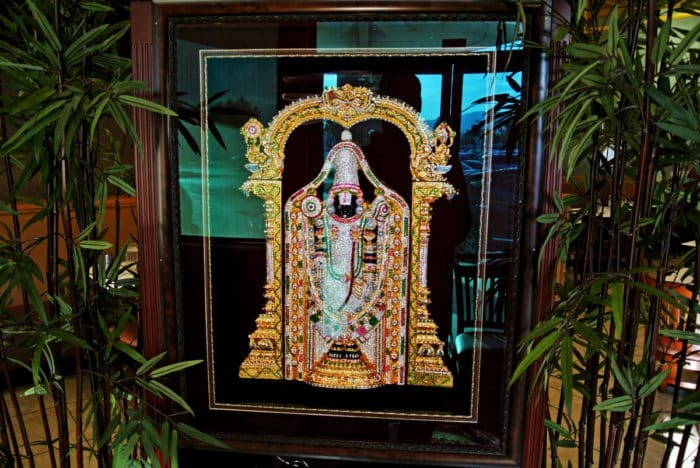 Got another authentic Indian spot in Silicon Valley I should check out? Let me know in the comments below. 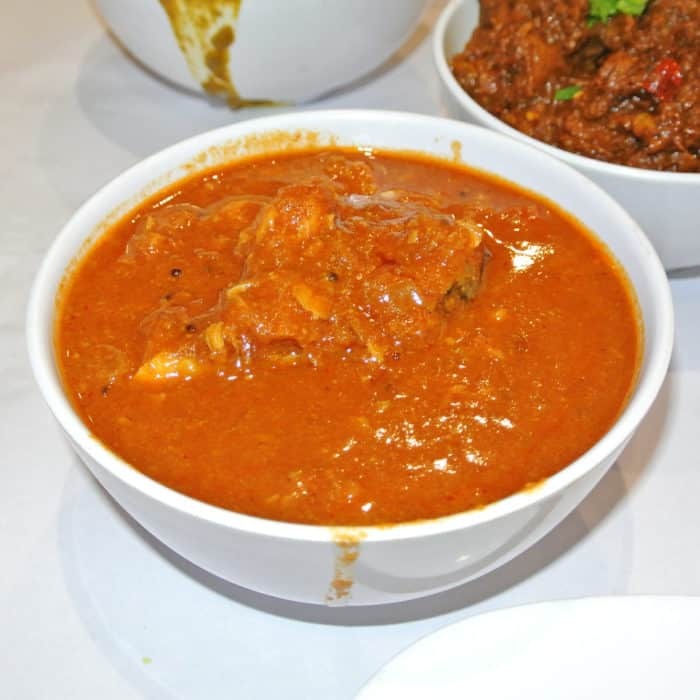 Whats your favorite authentically spicy Indian spot in NYC? 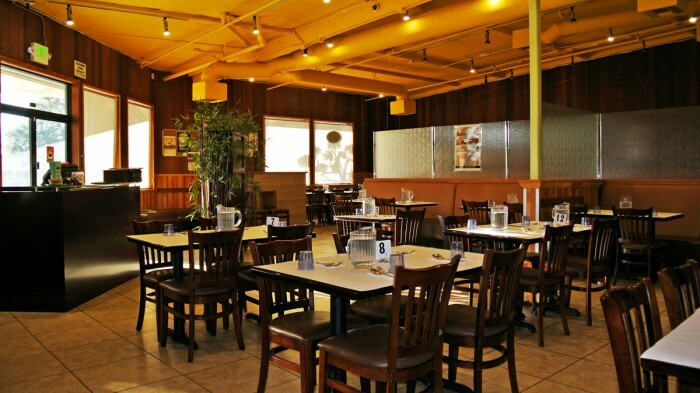 In Manhattan, I frequent Bombay Fish Co., Thelewala, and Desi Galli. All three of those will roast you if you let them.